Brandhome created the new DELTA-campaign for the launch of their All-in-1 multimedia concept. We worked out the strategy in cooperation with DELTA. We were responsible for the creative translation and production of the new All-in-1 concept. 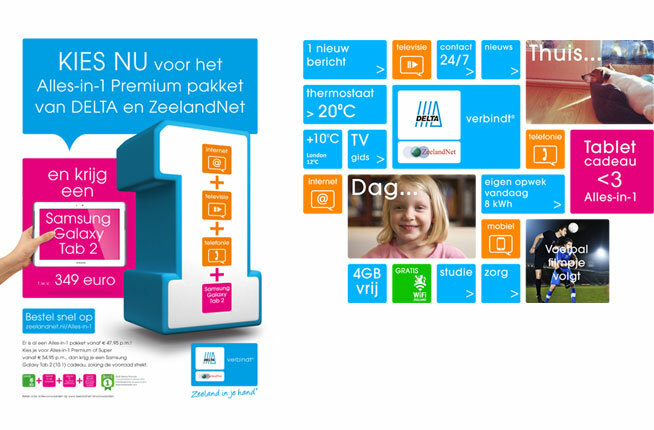 The campaign consists of TV, radio and online ads, for which a partnership was established with the well-known Zeeland-based band Bløf. They re-recorded their song ‘Beter’ exclusively for the campaign. In a later stage, DELTA’s All-in-1 packs will go beyond multimedia services. They will offer all DELTA services as well as third party services – in-1. They are developing an interactive platform for this now. We are busy developing the marketing campaign simultaneously with input from DELTA.